I do love to try something new in the garden each year. Here is a gorgeous bloom I spotted this morning in my garden. This is the first time I've seen it in person because I've never grown this plant before, such a gorgeous bloom for a food plant. Anybody recognise it? I can't wait to taste the results. You're right, it does look a lot like an eggplant. This one is actually from a sweet potato plant. It's my first time growing them and I had no idea they had such a beautiful bloom. 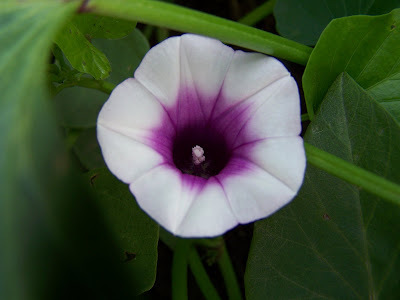 We grew sweet potatoes last year, and were away when they were blooming I think...I never saw these flowers in the garden, yet we got some small sweet potatoes. They must have bloomed in amongst the weeds ;-) Truly beautiful... a little like annual morning glories! Erin, do you know what is really strange? 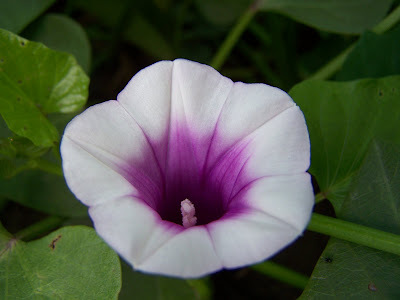 I went back the next day with the boys to pick more beans and the blooms were gone! I don't know if they only bloom for one day or ?? That is the one sad thing about having a garden away from your home, I miss the daily observations.